The “Stanzas” are translated from Italian as rooms – these are the frescoed halls in the Vatican Palace. These premises belong, which brought together on their walls the masterpieces of many artists, the Pope of Rome. Today there is a museum where everyone can get acquainted with the picturesque interior. The great Italian master of the Renaissance Rafael painted 4 rooms with students trained in his technique. The pupils added another large room without the help of a famous teacher. “Stanza della Senyatura” – the first room, which was completed by the master. Literally, its name translates as “signature room”, according to historical data here the Pope was engaged in official duties – signed the documents sent. The room includes 4 compositions depicting the essence of 4 spheres of life. The first, and the most admired by many, is the Athens School. 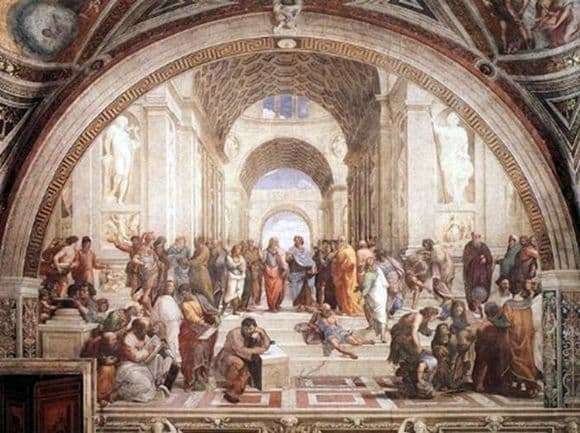 It highlights the central figures of Plato and Aristotle, which we see as Diogenes, is busy with the science of Pythagoras, and also conduct their outstanding activities and other thinkers. This image represents the personification of philosophical science. “Dispute” – a religious fresco. Its theme is the victory of the truth of divine revelation. All the Saints are seated on the heavenly throne, on the opposite side – on earth, the Church on Earth enthusiastically debates and interprets religious ideas. “Wisdom, measure and power” – the figures of women represent the ecclesiastical and civil law. The composition “Poetry” shows us the abode of the Muses, where the beautiful Apollo, surrounded by poets, plays the lyre. The artist painted the papal apartments very young, Raphael was 25 years old, but this did not prevent him from creating truly brilliant paintings. The ensemble of frescoes tells us about the high dream of the Renaissance about the moral, spiritual perfection of man.